I was struggling a bit when enabling Azure Automation Desired State agent by means of Terraform (0.12). While the official documentation was sufficient to enable Azure Automation, configuring the actual LCM on Azure VMs (Windows based) needed a bit of fine tuning. Here’s the TF code for azurerm_virtual_machine_extension resource, making use of the Microsoft.Powershell.DSC Azure VM extension that worked for me (note to myself). It will put a Windows IaaS VM into Pull Mode, pointing at Azure Automation’s internal DSC pull server. description = "Azure Automation azurerm_resource_group name"
description = "Azure Automation azurerm_automation_account name"
description = "Azure Automation azurerm_automation_account endpoint URL"
description = "Azure Automation azurerm_automation_account access key"
Regarding the compilation of the DSC configuration. This may either be triggered on the Azure Automation platform but the solution becomes much more flexible if an offline MOF creation pipeline is in place. In that case, the resource azurerm_automation_dsc_nodeconfiguration can be useful. Credits go to Sage McEnry’s post on the same topic which helped a lot with getting started. I cannot count the hours I have lost initially – later, every time that tiny little error appeared, I would remember that the solution had been easy. Time to finally write a note to myself! The "PackageToBundle" task failed unexpectedly. Microsoft.Deployment.WindowsInstaller.BadQuerySyntaxException: SQL query syntax invalid or unsupported. Done building project "my.ConnectedMG.Library.mpproj" -- FAILED. The solution in my case: Check each Management Packs’ LanguagePack. I would get above error when using certain special characters in the Name or Description element (e.g. single quotes). After removing those from the LanguagePack, the MP seals just nicely. I have no idea how often I have used PowerShell scripts to build or extend SCOM Management Packs. Almost daily it must have been. Occasionally I stumbled over PowerShell version issues because the SCOM agent had its own logic of choosing a PowerShell version. To circumvent these, I basically limited myself to write (and test!!!) my scripts on PowerShell 2.0 and .NET 2.0 environments. What this do not easily reveal: Since .NET Framework 4.0 is now chosen, the SCOM agent and SCOM management server can use PowerShell 4.0 or 5.0. That is fantastic news. It means the SCOM agent (Microsoft Monitoring Agent respectively HealthService) is now making use of the most recent PowerShell version installed on an OS. Note on legacy Windows versions: PowerShell 2.0 is the minimum requirement to use the agent’s PowerShell modules. And PowerShell is always installed or upgraded as part of the “Windows Management Framework”. So at last I can start writing PowerShell workflows for SCOM in 4.0 or 5.0 manner – provided I can guarantee that every agent has UR7 or later installed! When you look closely at the output of the table above, you can see that the PowerShell host is “OpsMgr PowerShell Host”. SCOM PowerShell modules are not running on Windows’ native PowerShell host (ConsoleHost). Instead a SCOM internal host is used, that is optimized for agent use. Occasionally this can lead to issues with very advanced PowerShell workflows. If this happens, and only then (!) the following approach may be used. Instead of using the native SCOM PowerShell modules, the System.CommandExecuterProbe can call PowerShell.exe. However; you have to make sure, the execution policy for our workflow is set no stricter than “RemoteSigned”. Otherwise the script will not be run. Examples for this are found in SharePoint MPs or were used back in SCOM 2007 days to run PowerShell scripts. Or have a look at my own sample MP linked at the end of this post. The management pack linked below contains three diagnostic tasks, targeted at the HealthService object. 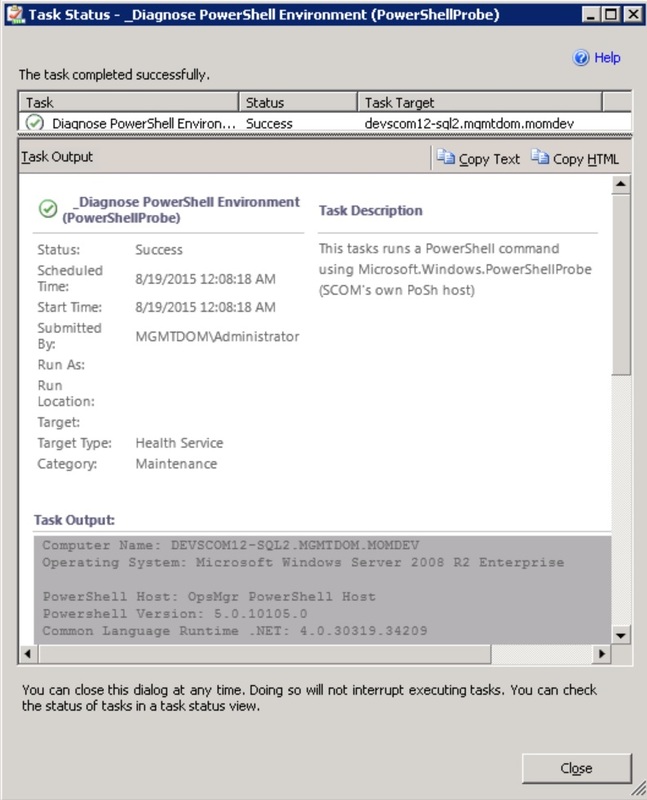 They do provide output on the PowerShell environment used by the SCOM workflows. Essentially the objects $PSVersionTable and $Host are being reported. I am including both the unsealed pack and the VSAE project as a reference. Happy MP authoring. In the last 10 months I have added several minor features to the certificate verification management pack for SCOM 2012. Some of them rose from needs of clients but most were suggested by people using the MP. Many thanks for everyone providing feedback and especially for testing the pre-release builds. You can head over to the SystemCenterCentral.com management pack calalog and download the updated MP version 1.3.0.0. While some changes are pretty much self explanatory, I am going to give you some background information on others below. Plus two little PowerShell bits to make everyone’s lives a bit easier. $store = New-Object  System.Security.Cryptography.X509Certificates.X509Store "My","LocalMachine"
$unarchive = New-Object System.Management.Automation.Host.ChoiceDescription "&Yes", "Set Archive Flag to 'false'"
$skip = New-Object System.Management.Automation.Host.ChoiceDescription "&No", "Keep archive flag"
Since there’s no undo option for deleted certificates, the MP does not contain a task to delete certificates. Disabling monitoring for a single certificate is achieved by appending the tag “_DoNotMonitor” to the end of a certificate’s friendly name. Such certificates are then becoming members of a group and monitoring will stop by means of predefined overrides. Instead of using the SCOM task, a system administrator might simply use the certmgr snap-in to alter the friendly name. The rediscovery task will only be available, if the additional MP ReDiscoveryTasks has been imported. It will run a management server side PowerShell script, triggering the SCOM task “Trigger On Demand Discovery Task“. Overrides will be accounted for. Such, changes to an agent’s certificate store will be reflected much more quickly in SCOM. The progress can easily be verified by checking the “Task Status” view. Note that the ReDiscoveryTasks MP will also attempt to run an OnDemand discovery after Archive and Enable/Disable tasks have been performed. They do behave exactly the same as the related tasks mentioned above. They will show their effect on the SCOM repository within minutes if the optional ReDiscoveryTasks MP is imported. Otherwise monitoring will not stop until the next discovery cycle has passed. Windows Server 2012 and 2012 R2 feature a new certificate store called “Web Hosting”. Behind the scenes it provides more load efficient certificate handling and is thought to be used e.g. with IIS in web hosting scenarios (what a surprise). When using the QuickStart override MP, those stores and all signed certificates in them will automatically be discovered. Monitoring wise it is important to understand that this store is thought to hold hundreds of certificates. Hence thinking about a good filtering strategy for monitoring may crucial. Failing to do so could lead to way too many objects being discovered, causing performance issues on SCOM. Consider making use of the Subject, Issuer and Template filtering capabilities. Certificates issued by Enterprise CAs can now be filtered based on their template name (and OID). Consequently, the template property has been added as an additional property to the certificate and will be listed on inventory reports. The alert description of monitors has been overhauled to be much more verbose. Specifically it is now showing both the subject and the issuer property. It also contains information about the RunAs account used for monitoring and gives details on the validity of the certificate chain. Such it has become much easier to pinpoint issues when not the end certificate itself but a chain certificate has become invalid; possibly just in the context of the RunAs account of the agent. An extra hint regarding the latter in case the agent is running under the local system account: Occasionally it can be observed that a certificate chain is reported invalid by the MP but is valid if a certificate is checked with an interactive user account. One possible reason for this can be the SYSTEM account not being able to automatically update CTLs (e.g. due to internet access restriction), while an interactive account can. If the issue cannot be resolved, consider using a tool like SysInternals PSExec.exe to launch the CertMgr.msc in the SYSTEM context to investigate the cause. And now for the task scheduler: Today’s update has been on my to-do list for a very long time. Same story as with the certificate MP: I have completely re-written the scheduled task MP based on PowerShell, aiming to fully support SCOM 2012 and Windows 2012. SCOM 2012 and 2012 R2 only. Windows 2008, 2008 R2, 2012 and 2012 R2 support (limited Windows 2003 compatibility via legacy MP). PowerShell Scheduled Job support added (PoSh 3.0 and later). Timing is mostly event-driven: significantly reduce the number of script calls required on the average agent system. Verbose filters to adjust task discovery. Disabled root discovery out-of-the-box (quick start MP included). Disabled advanced monitors and rules out-of-the-box. Please read the included MP guide and the release notes carefully. Especially if you are upgrading from the previous (SCOM 2007) MP version. Please make sure that PowerShell >=2.0 is installed on all agents that require task scheduler monitoring. Previous versions of this MP had the root discoveries enabled. As this was changed to disabled, you will need to configure re-enable overrides to the required discoveries plus advanced monitors if you were relying on them. Download: Scheduled Task MP 1.1.1.1 (legacy SCOM 2007). Note that this version is no longer being developed. All characters (including blanks) are being taken into account. The discovery filters are using .NET RegEx expression syntax. Please test your expressions using a suitabe tool before using them for your overrides (I am often using Regex Hero but there are plenty of other options out there). Once store discovery is enabled, the default filter settings of the MP will discover any certificates with the exception of self-signed and MS NAP ones. Refer to the MP guide and the release notes if you plan to make use of the advanced filter options. And remember to override the store discovery, not the certificate one.